In surveys that ask people about their fears, about one person in five reports an extreme fear of public speaking. Shyness and other forms of social anxiety are common – and they prevent people from fully experiencing life. Shyness refers to a tendency to withdraw from people, particularly people who are unfamiliar. Everyone has some degree of shyness. In fact a person without any shyness at all is probably one who does not make good judgments about maintaining appropriate boundaries between people. A bit of shyness is a good thing. But when a high level of shyness prevents a person from engaging in normal social interactions, from functioning well at work, or from developing intimate relationships, it presents a problem – which, fortunately, can be alleviated. 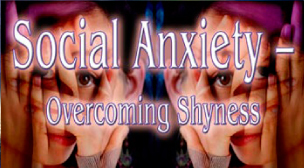 Shyness is one form of the broader term, social anxiety. This concept, also known as social phobia, refers to a special kind of anxiety that people feel when they are around other people. It is associated with concerns about being scrutinized. Shyness and social anxiety are closely related, but social anxiety includes other situations such as speaking in public, taking tests, sports performance, and dating. Closely related to the concepts of shyness and social anxiety are embarrassment and shame. Embarrassment is what a person feels when something unexpected happens and draws unwanted attention (such as knocking over a glass of water in a restaurant). This creates a temporary feeling of discomfort. Shame, on the other hand, is more long-lasting. Shame is a feeling that comes from being disappointed in oneself. there is excessive concern about what other people think. National surveys find that about five percent of children and adolescents suffer from a social anxiety disorder. Children with an anxiety problem seldom report that they are feeling anxious. Instead, they report the presence of physical symptoms, which include headaches, stomach aches, nausea, rapid heartbeat, dry mouth, blushing, dizziness, and shortness of breath. They try to avoid the following situations – speaking in class, taking tests, reading aloud, writing on the board, inviting friends over to play, eating in front of others, going to parties, and playing sports. Children and adolescents with social anxiety disorder may go on to develop other related problems, such as loneliness, depression, and low self-esteem. Although some children will overcome their shyness in time, as interactions with others cause their fears to dissipate, others will experience a worsening of symptoms. If a child shows symptoms by the age of six that have not improved by the age of ten, it is probably time to seek a professional intervention. Those who suffer from social anxiety engage in excessive self-focus. Their thoughts focus internally on themselves rather than on the external world around them – and this only serves to increase anxiety levels. Furthermore, excessive focus on the internal symptoms means that one loses important information about what is going on externally, and it may give others the impression that the anxiety sufferer is trying to be distant from them. When feeling anxious, remind yourself to focus on others. Think about the other person, what this person is trying to say, how the other person feels, etc. If your attention moves back to your anxiety, try not to feel that you are failing. Just let it pass and refocus on the other person. Try to avoid planning your responses to the other person. Allow yourself to have some spontaneous reactions to others. Try not to engage in mind-reading – that is, trying to figure out what other people are thinking about you. They are probably much more interested in themselves. The first step in overcoming negative thoughts is to be aware of them. It helps to have a trusted friend or therapist give you feedback about negative thinking patterns. Then ask yourself how realistic the negative thought might be. For example, “If my hands shake during my presentation, everybody is going to laugh at me.” Have you ever been in an audience where everybody laughed at a person whose hands were shaking? Not likely. In fact, people tend to support a person having a hard time – and they may be drawn to your vulnerable and very human nature. Now ask yourself, what evidence do you have for your negative thought? Can the situation be looked at in a different way? The single most important strategy for overcoming social anxiety is to face your fear. Get back on the horse again. Take the car out for a drive once more. Go swimming again. Get back on an airplane. Give another speech before an audience. Go to another dinner party. Ask somebody else to go out on a date. Managing your physical symptoms and changing your thinking do little good unless you come to terms with your fears by getting back into anxiety-provoking situations. Doing this takes courage. Avoiding it perpetuates the problem. When you put yourself back into the anxious situation, realize that there are coping mechanisms that you may not have used before. You know that you can change your negative thinking and you can manage your physical symptoms. And facing the anxious situations can be done gently, one step at a time. First, develop some practice assignments that directly challenge your fears. Make sure they are relevant to the anxiety. Make the assignments increasingly more difficult. And make sure that you can repeat them for practice. For example, if you fear public speaking, start out with making conversation with one person. Then move on to talking to a group of two or three people. Then talk to five people in an informal group. Move on to asking a question in a formal business meeting. Then talk at more length in the business meeting. And finally, after you have repeated all of these steps several times, find a way to speak in public to a large group. As you practice going into anxiety-provoking situations, remember to relax your body. Deep breathing techniques are especially effective. Practice deep breathing until you can put your body into a relaxed state on purpose. Then go into the anxiety-provoking situations in a relaxed state. You’ll be ready to face your anxiety. It takes courage, each step of the way, but you can be successful. Anyone can master the art of having good conversations with others. Those who are shy or socially anxious may see this as an unattainable goal, but with enough practice, and using the right techniques, it can enhance the quality of social life. The first skill to acquire is making eye contact. Shy people may avoid eye contact at all costs, but this perpetuates self-focus and anxiety. When you are listening to someone else, maintain steady eye contact with that person. If you are doing the talking, vary your eye contact – that is, have eye contact about half the time, and then look away for a few seconds. (Note, however, that different cultures have different rules for eye contact.) Also understand the value of smiling, which is a nonverbal cue that you are approachable and interested in talking to the other person. Learn the value of good listening. The other half of conversation, and it is perhaps as important as talking, is playing the role of listener. Allow other people to complete their thoughts. Encourage the other person to talk by maintaining good eye contact, using gestures such nodding your head in agreement, and making supportive comments or asking brief questions. People who are shy frequently say that they cannot go up to another person to start a conversation. This represents avoidance. Start out by initiating as many brief interactions throughout the day as possible. Smile and say hello when you pass someone. Tell the postal worker or grocery checkout person to have a good day. Make a comment in the elevator, such as, “Isn’t this perhaps the slowest elevator in the world?” Before long, making the initial contact will seem easy. Finally, learn the value of small talk. Many shy people say that they don’t want to waste their time on trivial talk – or they also say they don’t know what to talk to other people about. It is important to understand, however, that people need the small talk before moving onto heavier topics. Small talk can comprise anything from commenting on the weather to griping about the price of milk. In order to avoid conflict, however, it is best to dodge talking about religion or politics – at least initially.